So, here I am, on vacation. If by vacation you mean, not darkening the door of my employer. I am still studying and that is really cramping the usual vacation style! 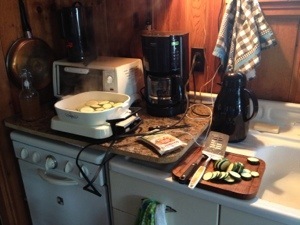 Part of vacation is keeping it simple and when you have the tiniest of kitchens with limited cooking facilities, you must be creative (or actually let go of that). 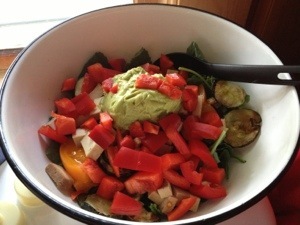 To me, vacation-creative-cooking means finding healthy choices with little prep or cooking. I limit any prepared foods to those with minimal to no processing, presliced veggies and fruit are fine, though a trip to the farmers market makes chopping and slicing worth every moment! Put everything in a large bowl, toss together. Frying the zucchini gives it a wonderful carmelized flavor. Of course, you could grill it, but we don’t have a grill at camp, so frying was the only choice. I didn’t specify how much guacamole because it depends on how much you want it coating your salad. I like it quite moist. Then, we sat down to eat.